What Has Happened to Rashad’s Tea? In the middle of Ramadan this year, farmers in Iraqi Kurdistan experienced bombing by Iran. In the last three years there were not any bombings along the border with Iran. It was also the first time the area of Barbazin in Sidakan sub-district was bombed so heavily. 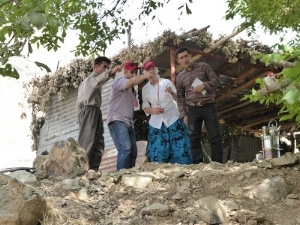 The team decided to visit the area and to learn what had happened. After driving for several hours on the highway and unpaved roads we had the privilege to met Rashad. While I parked the car near his house, I could see him outside making a fire for his tea. Rashad stood up to look at these strangers coming to his tents. As I greeted him, he very warmly greeted me in return and firmly shook my hand. Through his eyes and smile I could see that he was excited to know more about who we were. After the introduction of the team, he started to tell us what happened to his family during Ramadan. He also said he could call his mom over to speak with us. She would know more about the bombings because Rashad was not there on that day. I noticed he had difficulty walking and I was not sure if he was disabled or if he had lost his leg because of a landmine. The reality of life in a border village is that there is always one or more disabled villager who has lost a part of their body because of mines. As we walked the beauty of farm land disappeared, and we were walking through fields that had been burned black by the fires that started during the bombing. “Some families decided to not come back again after bombing because they lost everything.” Rashad said. Rashad is showing the fragments from the bombing to CPTers. Photo by: Julie Brown. We arrived to the location of the exploded bomb, he pick up some of the pieces left from the rocket to show us. My mind started to think, what are those connections between the villager’s soul and the land? How many of us are ready to stay in an unsecure area and still show our smile and not be disappointed. Rashad appreciated our visit and was so grateful. He hopes there will not be bombing anymore and there will be peace so we can have tea together without fear.